Under The Copper Tree: Perfect Keto "Review"
The first day of the last month of the year. Curious how the rest will pan out. NOTE - This is not a paid post. I'm not cool enough to do things like that. I once was... maybe. And honestly, what follows isn't something they would pay me to say. 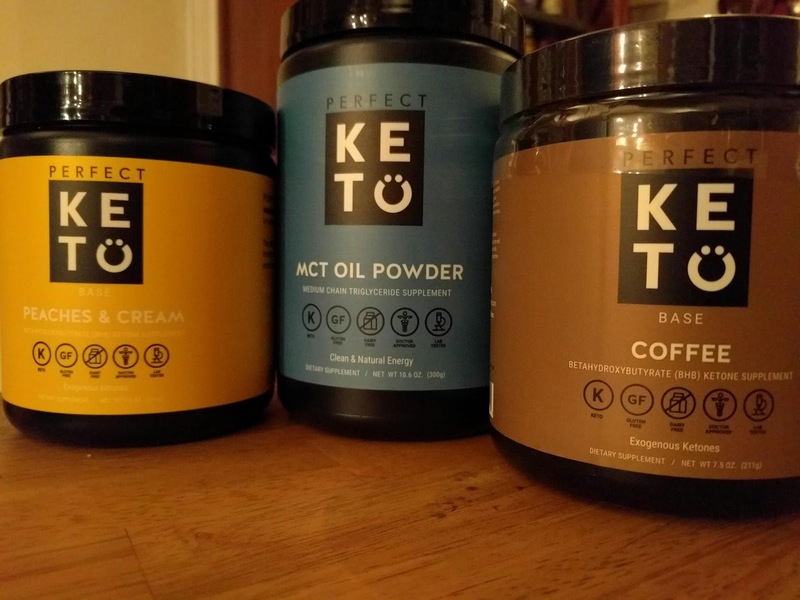 One of the few items I bought on Black Friday was a jar of coffee flavored base from Perfect Keto. As you can see, it's something I've bought before, and use somewhat frequently. Enough that I thought buying another flavored base made sense. Long story short, these bases and MCT oil powder are what some people use to get into ketosis. Fat burning mode. Health... weight loss... blah blah blah. Diet and exercise? Oh yeah. But I get by with a little help from my friends. Or in this case, exogenous ketones and powdered medium chain triglycerides. I started with the peaches & cream base. I forget when I bought it. Early summer? I was listening to a podcast (can't remember which one) and they had mentioned using exogenous ketones to help with intermittent fasting. Figured why not, and ordered some ketones. The 40 percent off didn't hurt, because this stuff is pricey. PRO TIP - Don't go by the suggested serving size. That's a big scoop, and you're supposed to add it to 8-10 ounces of a liquid. I'm sorry, I tried it that way, I spit it out. It needed to be watered down. A lot. Now, I add about a third of a scoop to a liter of water, and that amount is tolerable. It may be the salts, or the stevia. Probably the stevia. Stevia is nasty. Also, the less you use per serving, the longer you can stretcher out that container. Which costs sixty bucks, btw. From there I bought the MCT oil powder. I have the liquid MCT oil, which I use in my bulletproof/rocket fuel/fatty coffee. So why get it in the powdered form? Well, it works better than liquid MCT oil in other recipes. And, no oily film on the top of my coffee after the froth has disappeared. I've had no problems with this product, and will be buying it again. PRO TIP - Don't start with a full scoop!! Save your GI tract. Start small (1/2 scoop, maybe less), and slowly work your way up. This applies to both liquid and powdered form. And now I have a coffee flavored base. Smells like coffee, which it should since it has ground coffee in it. Also has stevia, which boo. Half a teaspoon of the coffee base and half a teaspoon of the MCT oil powder to a large mug of coffee. Whipped up with a milk frother, and a splash of two of half & half. Because I like my ketones and triglycerides with coffee and cream. Okay, I'm done. Have a good Friday.